The trailer also shows off in-game footage of Alolan Diglett and Alolan Dugtrio, as well as Ultra-Beasts 03 and 05. But I'm guessing that you've already seen those, considering how there seems to be more and more leaks as we inch closer to the game's November 18 release date. 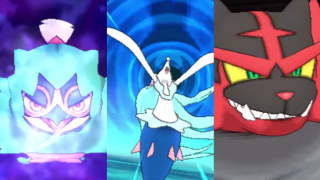 So let's appreciate the sheer ridiculousness of each starter's Z-Move, huh? Decidueye's Sinister Arrow Raid is an elegant bombardment from above. Incineroar's Malicious Moonsault turns the battleground into a wrestling ring. And last but not least, Primarina's Oceanic Operetta is basically the Pokemon equivalent of Goku's Spirit Bomb. It's also a hella long animation, hence why we couldn't even squeeze it all into the gif you see above.